Could this one-armed robot lead the next industrial revolution? Will this one-armed robot put you out of a job? 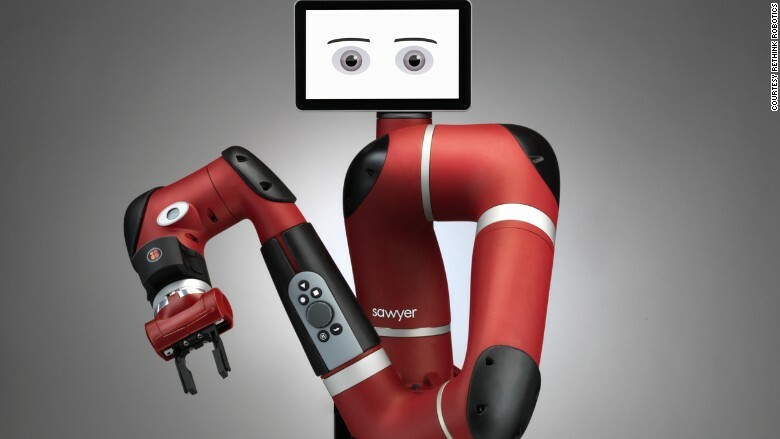 Sawyer the one-armed robot is intended for assembling electronic goods, and costs $29,000. Sawyer the one-armed robot can do many things. It can assemble goods on the factory floor day after day without tiring, taking toilet breaks, or asking its boss for a raise. What Sawyer can't do, however, is understand the human debate swirling around its potential to revolutionize manufacturing -- and society -- as we know it. Depending on who you speak to, robots like Sawyer either foretell a new era of global unemployment, or save us from the kind of dull jobs you wouldn't wish on your own child. It's a lot of responsibility for a 3.3 foot tall robot with one arm and a touch screen for a face. Barely a month old, Sawyer has already made a name for itself as the new kid on the robotics block with a super-flexible limb able to perform intricate tasks once thought out of the realm of machines. 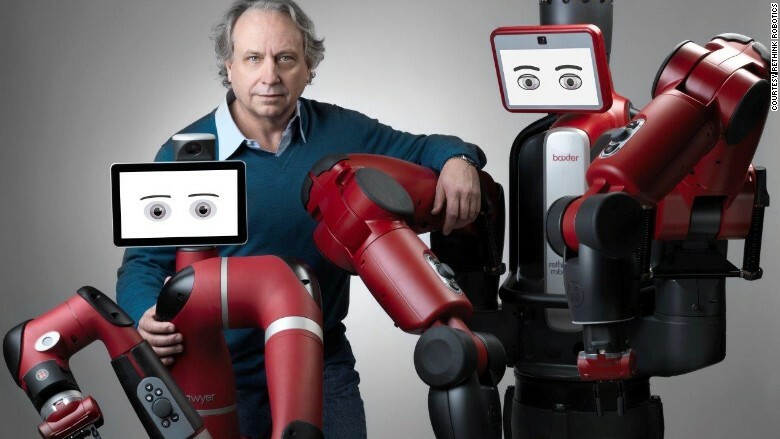 Expect to see Sawyer tinkering with circuit boards alongside its human colleagues on the factory floor, says creator Rodney Brooks, of Boston-based company Rethink Robotics. "We're aiming at the electronics assembly industry -- and most of that will be in Asia," said the Australian-born engineer, who is also behind the bomb disposal PackBots that were used by the U.S. military in Iraq. Sawyer's unusual one-arm design came after analyzing over 150 factory tasks, and finding many could be done with just a single limb. The $29,000 robot will be a "baby brother" to Baxter, a larger two-armed robot launched in 2012 and better suited to heavy lifting than fiddly maneuvers. Both have animated eyes that look in the direction they're about to reach -- just like humans. Engineer Rodney Brooks with his robots Sawyer and Baxter. But Sawyer's increased dexterity could also bring us one step closer to what Silicon Valley entrepreneur Martin Ford describes as the "End Game" of manufacturing -- a time when factories are almost entirely manned by machines. "Robots are moving into the realm where they're beginning to compete with people for those kinds of jobs that rely on hand-eye coordination -- things that up until now, only people could do," said Ford, who is also the author of new book "Rise of the Robots: Technology and the Threat of a Jobless Future." "What are we going to do for the people who are displaced? The evidence suggests that there aren't going to be enough new jobs created in other areas. There will be some -- for engineers and so forth -- but the numbers don't match up." As robots become more advanced, it's not just factory workers at risk, but service staff and office employees, he added. "This is a huge issue -- something ultimately in the order of climate change, in terms of the challenge it represents to society." Brooks sees things differently, arguing that companies are already struggling to find enough people willing to do menial manufacturing jobs -- let alone robots. "If it was the case that people were lining up wanting factory jobs, then that would be a valid fear. But in the U.S. the average age of a factory worker is over 55 -- people don't want those jobs!" says the former director of MIT's Computer Science and Artificial Intelligence Laboratory. 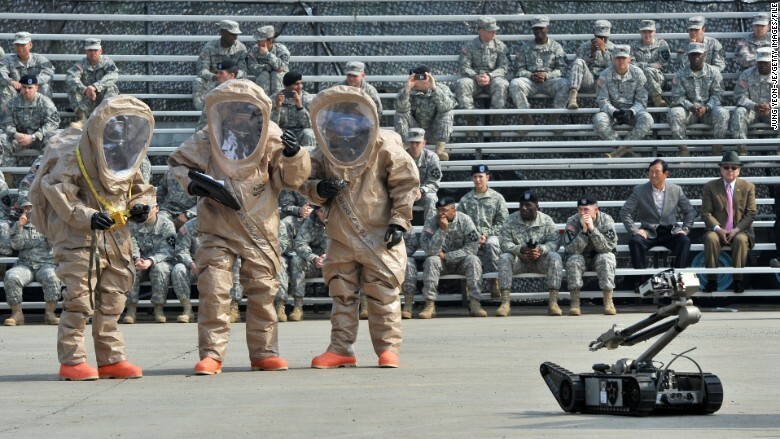 U.S. soldiers give a demonstration of the bomb disposal Packbot, created by Rodney Brooks' former company iRobot, alongside co-founders Colin Angle and Helen Greiner. "When people say to me 'robots are going to take away jobs,' I always ask them 'do you want your child to work in a factory?' And they always say to me 'oh no, not my child, but you know, other people's children.'" Brooks says dexterity is one of the biggest challenges in robotics today. "We just don't know how to build dexterous hands. It's an area where there hasn't been much progress in the last 40 years," he said. "So that's one of the reasons robots are not going to take over the world and replace everyone," he said. "I think this is where Hollywood confuses everyone. Robots are really not very smart. They don't understand what they're doing or why they're doing it," added the 60-year-old engineer, who first started building robots as an eight-year-old. Both Sawyer and Baxter are named after archaic English words for professions -- "Sawyer" meaning someone who saws wood, and "Baxter" meaning a woman who bakes. "The names are for old professions that aren't in use anymore," explained Brooks. Whether they will one day replace the occupation of "factory worker," remains to be seen.